Unless you are a professional contractor, there are certain types of home or business repairs you shouldn’t attempt on your own, one of them being plumbing. In order to perform highly accurate plumbing work, you need years of training, licensing, and skill. Those that decide to try their hand at amateur plumbing often end up making the problem worse, more times than not. If you live Downriver, you may be unsure as to which plumbing company you should hire. When in doubt, always go with the best, and the best in Downriver, Michigan is Downriver Plumbers. Our licensed plumbing contractors are accustomed to responding to major plumbing emergencies on a daily basis. If you are having trouble with your plumbing supply line, you need expert help, and fast. How can you tell if your supply line has gone bad? 1) If you notice any leaks beneath any of your piping, that could possibly indicate a broken supply line. 2) If you observe any buckling or bulging throughout your plumbing lines, that may also be a telltale sign of trouble. Any time you see unusual events like these, you should consult with a reputable, licensed plumbing company. What might seem like a small leak initially could turn into a giant, flooded mess if you don’t seek help immediately from experts like ours at Downriver Plumbers. We have all the equipment required to climb up into hard to reach places in order to examine every inch of piping throughout your MI property. Our specialized plumbing tools allow us to quickly diagnose your problems so we can fix them and stop any leakage. What causes a broken supply line? 1) Low-grade materials – if a contractor used substandard materials during the construction of your home, your piping may not be as durable as you need it to be. Downriver Plumbers can easily repair any poorly designed sections of piping you may have, replacing it with the strongest supply line possible. The average homeowner cannot just walk into a home improvement store and readily know exactly what type of plumbing line they need as a replacement. Only licensed plumbers such as ours have the expertise it takes to properly identify problem areas in your supply line and substitute it with the highest quality materials available. 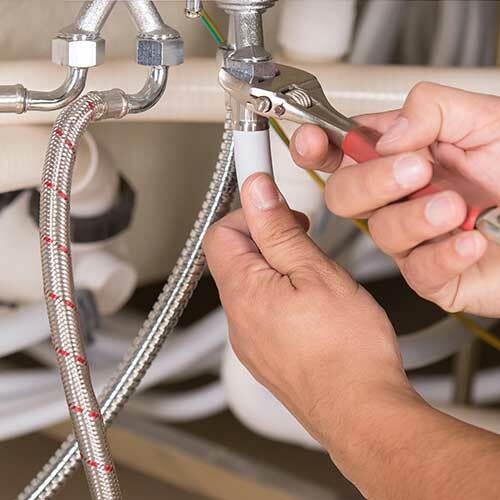 2) Poor maintenance and/or inferior prior plumbing repairs – if an unlicensed or non-legitimate plumber did not know how to correctly repair your home’s piping in the past, or improperly repaired it by using cheap tape or other questionable methods, those are also reasons that may lead to a broken supply line. In either case, the only logical solution to pursue to call and make an appointment with the #1 plumbing company in Michigan – Downriver Plumbers. One call to us, and before you know it you will be on your way to finding out exactly what is wrong with your supply line, and having it repaired, promptly and effectively. Our Downriver customers feel confident calling us and taking advantage of our more than 20 years of experience. To read a few testimonials from our satisfied clientele, check out our website at https://plumbersdownriver.com. There, you will also learn more about our other repair services, money-back guarantee, and convenient insurance claims assistance. Call 734-548-9925 for your free estimate. Don’t let a small leak turn into a big headache! Let Downriver Plumbers handle it.